The renovation of the Secession and its imposing golden dome is already finished. Thanks to all of you who have contributed to the gilding of the leaves! 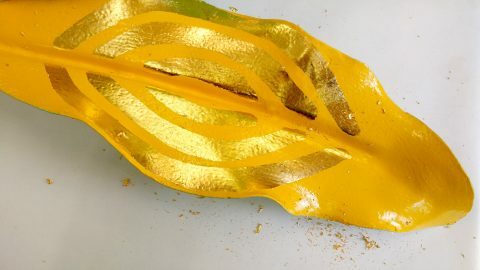 With a contribution of €100 more than 1.500 leaves could be gilded. The Secession’s home is one of the best-known works of art nouveau in the world. Visible from afar, the dome of interwoven golden laurel branches is composed of 2,500 leaves and more than 300 berries. It was constructed in 1897–98 based on designs by Joseph Maria Olbrich. The play of shimmering hues and manifold light reflexes makes the foliage seem almost alive. “Cabbage head,” the mocking name the Viennese coined for it, has long become a term of endearment. Around three decades have passed since the last general restoration, and so it was time for a fresh round of renovations and modernizations. As part of this project, we also refurbished the dome, which measures over 25 feet in diameter. Welders repaired and strengthened the framework supporting the wrought-iron structure; the foliage was taken down and cleaned before all leaves and berries were regilded. We are delighted that many donors have contributed to preserving this important Viennese landmark. Name or inscription are listed on an electronic roll of honor. Unseren lieben Freunden in der Secession – Pixelstorm dankt für 20 Jahre Zusammenarbeit! Silvia & Günter Matejowics "with love"
Maria Schaden Happy Birthday 60! Unserem lieben Freund Martin "Puchi" Puchinger alles Gute zum 40er! Christa in Erinnerung an B.
Für meine immerjunge Martina Dorner-Bauer zum Geburtstag! Bärbel, jetzt hast Du ein goldenes Blatt in Wien! Happy Birthday! Rebecca Barbara (1999) - Weil wir Dich nicht vergessen! Für Franzi, Rosemarie und Michi - ich denke an euch!!! Zum 60er alles Gute, liebe Waltraud! Angelika & Erich Svoboda in ewiger Liebe! H&B - Happy 28. forever!! Vereinigung bildender KünstlerInnen Wiener Secession Aktion "Kuppel"